I first grew a tinantia many years ago after seeing it for sale on a small stall at a plant fair. It was Tinantia pringlei and it was a little beauty. Like a weak and sprawling houseplant tradescantia it had small, three-petalled, mauve flowers but it was the leaves that were so interesting: speckled with purple. In fairness it was hardly a showy plant but I hoped it might make interesting ground cover and it survived for many years either as the plant or by seeding. I still have a few that pop up now and then. So I was intrigued when I saw seeds of Tinantia erecta for sale and bought some without knowing much about it. Well today the first flower ‘opened’ and I am slightly amazed because the seeds were only sown in February. For speed of flowering that beats most bedding plants. 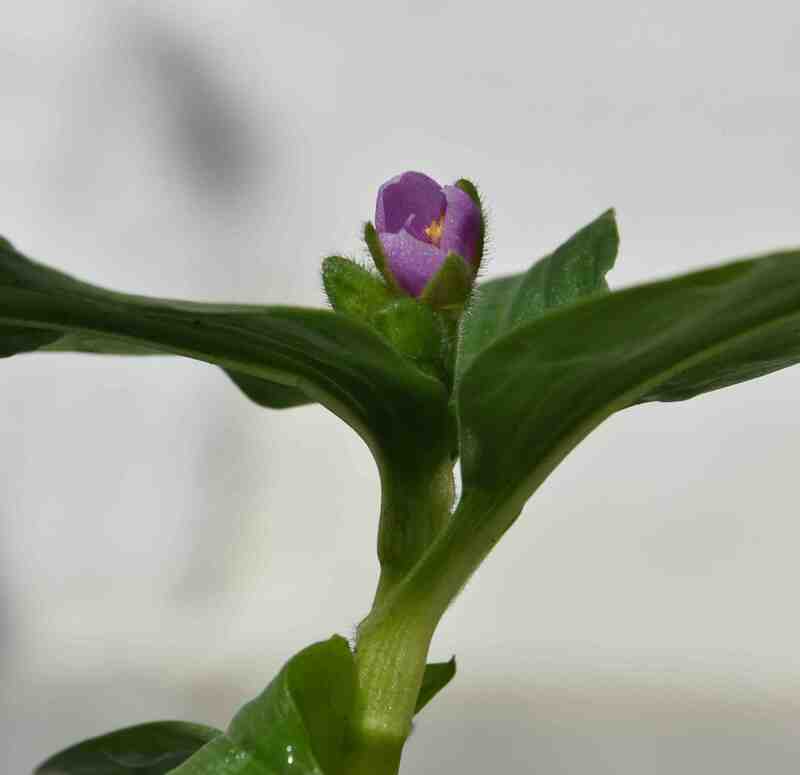 Tinantia is in the commelina family that includes many familiar plants such as the common houseplant tradescantia, the purple leaved setcreasea, the houseplant (in the UK) rheo, the tall and beautiful blue-flowered dichorisandra and the common spiderwort. All have alternate, linear leaves with a base that sheathes the stem and shortlived (a day or less), three-petalled flowers with distinctive hairy anthers. I am not sure what defines a tinantia but this one is very different to the other I grew years ago. Tinantia is an annual from the West Indies and will not tolerate frost. It branches freely and grows to about 75cm high and 60cm across. The pink flowers are not huge and are supposed to be open for only a few hours in the morning. My first flower hardly opened and it was only about 1cm across which is not that dramatic on a plant 75cm high but I am hoping that by the time my plant is that big it will have lots of them! It can be grown in sun or part shade and I have to say that I like the form of the plant even without flowers. I am always on the lookout for unusual plants and if they are pretty too then all the better. And if they are easy to grow then its win win all round. The fact that the seedlings are only two months old and 10cm high and have flowers shows promise. I sowed the seeds in February in a temperature of 20c. The seeds were covered with perlite and germinated in a week. I will report later when I have more experience of the plant. I got seeds from Chiltern Seeds. It might be interesting. It is supposed to be very frost-tender, dissolving with the merest touch of frost. It is really succulent and has a robustness of habit that makes it very interesting. I will let you know how I get on with it.